CASE Central has inherited a 15 years tradition of uniting professional knowledge of the law with real life experience. We are proud of recruiting most of our advisers from people who are, or have been, benefits claimants themselves, and who have real-life knowledge of how it feels – dealing with the anxiety of a benefit claim, being threatened with sanctions, suffering daily demonisation from the media, and feeling hopeless when the fridge gets broken as there’s no money to buy a new one… This tradition makes us special, as our clients don’t see us as ‘solicitors’ but as people like themselves. The trust we earn is very important for the outcome of our cases, but also makes people feel reassured, more empowered, less scared. Yet we are also proud of our expertise and knowledge of laws, regulations and procedures, a cumulative result of 14 years experience in this field. All our new volunteers are trained and introduced to CASE Central’s ethos and practice by our senior members. We do not stop at ‘advising’ people. Within our human limits we also help them making phone calls, and we accompany those who need it to Tribunal hearings, interviews or medical examinations. Sometimes we have also to comfort people in tears or calm down and reassure people who come while they are panicking and angry. Probably dealing with people’s emotions is the hardest part of our work! CASE Central is known and respected for accepting, and fighting for, very difficult cases and for its friendly service. If you want to read a selection of our most challenging and maddening cases, how we worked to help our clients, and how things went, please give a look at our Welfare Rights CASE Studies. 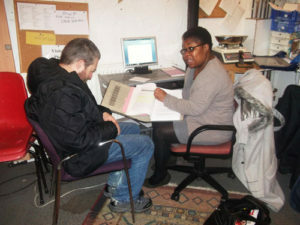 If you want to know what the local community says about our advice work click here. Our Welfare Rights Advice service has recently been recognised by the T.U.U.T Charitable Trust, with a donation which will specifically help us to continue our important activity in the year 2018. For the photos of the ‘ceremony’ attended by our Front of House manager and our excellent Welfare Rights Caseworkers, click here. We also sometime manage to have a word in the press on issues such as welfare and benefits. If you want to know more click here. On 25 November 2016 CASE Central forged a new alliance with Brighton Unemployed Centre Family Project in Tilbury Place, aiming at exchanging information and expertise in their common struggle to help benefit claimants and support the most vulnerable people in society. For photos of a joint ceremony held at BUCFP click here. 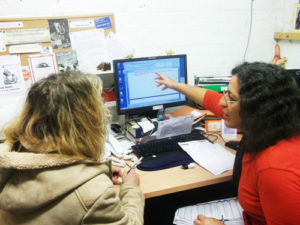 CASE Central is also a member of the Advice Service Network and has created connections with individual benefit advisers across the City through its work. 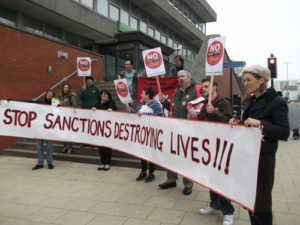 CASE Central is also ‘different’ because we have created living links with Brighton Benefits Campaign (BBC), a campaign group born in February 2010 to oppose benefit sanctions/cuts and workfare. BBC is formed by people on low incomes and benefit claimants who believe that the welfare system is the floor for wages and working conditions, and who promote solidarity among people in different situations – from unemployed and disabled people to people on Zero Hour contracts. This collaboration has been of great practical and human value. 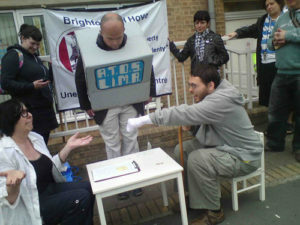 Benefit claimants who are denied their claims, or who are in other difficult situations, may find BBC through their campaigning in Brighton and Hove and through their website: this gives BBC the opportunity to refer them to us for help. In turn BBC receives from CASE Central updated information regarding changes in the law, welfare cuts, or facts that are useful for their campaign. An examples of this collaboration: A few years ago BBC published our phone number on a web page regarding the ‘Universal Jobmatch’ and claimants’ rights about its use. We soon became a mini ‘national hotline’, and have advised worried claimants from all over the country: including Skemersdale!